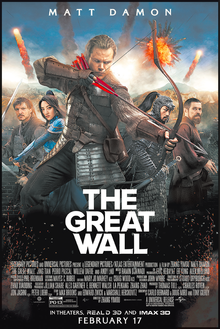 The Great Wall is a 2016 epic historical fiction action-adventure monster film directed by Zhang Yimou and written by Tony Gilroy, Carlo Bernard, Doug Miro, Max Brooks, Edward Zwick, and Marshall Herskovitz. The film stars Matt Damon, Jing Tian, Pedro Pascal, Willem Dafoe, Andy Lau and Eddie Peng. Principal photography began on March 30, 2015, in Qingdao, China. The film was released in China on December 15, 2016, by Le Vision Pictures and China Film Group Corporation and is scheduled to be released in the United States on February 17, 2017, by Universal Pictures. During the Song dynasty, a few miles north of the Great Wall, William, Tovar, and three other survivors from a European mercenary group searching for black powder are pursued by Khitan bandits. Upon escaping they seek refuge in a cave, but are attacked by a shadowy monster, leaving only William and Tovar alive, the former having slashed off the monster's hand. The next day, they stumble upon the Great Wall and are taken prisoner by Chinese soldiers, who are led by General Shao, General Lin, and Strategist Wang. The officers have been preparing for a monster invasion which happens once every sixty years. However, they are frightened upon seeing the monster's hand, identified as a member of the Taotie species, as they believed the invasion was still weeks away. Suddenly, a wave of monsters attack the Great Wall, and the soldiers respond with archery, ballistas, and catapaults which throw burning rocks. Lin leads a company of female soldiers who jump off the Wall and are pulled back with elastic cords. The monsters are more intelligent and numerous than the soldiers' expectations, but are repelled with William and Tovar's assistance, which earns the soldiers' respect. Later, William and Tovar meet Sir Ballard, a European who, like them, had ventured east twenty-five years ago in search of black powder, which might be sold for a fortune back in Europe. However, Ballard was also taken prisoner, and has been serving as an English and Latin teacher. The three men discuss plans to steal black powder from the store-room and flee while the soldiers are occupied by battle. During the night, two monsters manage to climb the Great Wall and kill a guard. 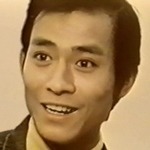 Shao and Lin lead a platoon to investigate, but they are ambushed and Shao is killed, leaving Lin in charge. Around this time, an envoy from the capital, Bianliang, arrives with an ancient scroll, which suggests that the monsters are pacified by magnets. To test this theory, William suggests that Lin should capture a monster alive using harpoons laced with sedatives, and delays his escape plans to help. At the next battle, several monsters are ensnared, and William bravely slides down a chain to ensure that an ensnared monster is not freed by other monsters. Tovar delays his escape to assist William, to Ballard's disappointment. The soldiers resist the monsters by fighting vertically along the Wall while tied to a chain, and by using spinning mechanical blades. As the monsters are too numerous, Lin resorts to using black powder rockets, whose existence had been a secret. After the battle, the captured monster is taken to the capital by the envoy. A short while later, a hole is discovered in the base of the Great Wall, which the monsters have used as a bypass, a reflection of their cleverness. While Lin investigates, Tovar and Ballard try to escape, and knock William unconscious for resisting. Some distance away, Ballard abandons Tovar, stealing his horse, but is captured by the Khitans, who accidentally ignite a bomb killing themselves and Ballard. Tovar reclaims the horses, but is captured by Chinese riders. Knowing that the monsters are nearing the capital, Lin orders the use of an unstable technology, namely hot-air balloons, to reach the capital more quickly. Most of the balloons catch fire and the soldiers fall to their deaths. William boards the last balloon with Wang, following Lin to the capital, where they find most of the city already ruined. However, they think of a plan to kill the queen monster by tying explosives to the captured monster from earlier, and giving the monster meat to deliver to the queen. The three people climb a tower to shoot a black powder rocket to detonate the explosives, during which Wang is killed. Two rockets fail, but the third succeeds, after William throws a magnetic stone at the queen right before the rocket hits. In the aftermath, Lin is promoted to regional General, and William forgoes a reward in exchange for freeing Tovar. The two are allowed to return to Europe and a contingent of cavalry are sent to protect them. Principal photography of the film began on March 30, 2015, on location in Qingdao. It is the most expensive film ever shot entirely in China with a budget of $135 million. Three walls were built during production as they could not shoot on the actual Great Wall. During the filmmaking, the director said the most impressive part for him was the presence of so many translators to handle communication as he assembled an international crew for the filming. More than 100 on-set translators worked with the various cast and crew members. The film's score is composed by Ramin Djawadi. The first track called "Nameless Order" was released by Djawadi for the fans on December 14, 2016. The Great Wall was released in China on December 15, 2016. It is scheduled to be released on February 17, 2017, in the United States by Universal Pictures. The Great Wall released its first trailer in July 2016. The trailer shows views of the Great Wall in fog, thousands of soldiers on a battlefield ready for war and a mysterious monster, as well as the roster views of the cast including Matt Damon and Andy Lau. A new song from Leehom Wang and Tan Weiwei was released on November 15, 2016, to promote The Great Wall. Bridge of Fate was composed by pop singer Wang with lyrics written by Vincent Fang, a long time collaborator of singer-songwriter Jay Chou. Female rocker Tan Weiwei joined Wang for a duet, but with two different vocal styles. Wang sang pop, while Tan performed a traditional Qinqiang - a folk Chinese opera style from Shaanxi Province. Chinese pop diva Jane Zhang released another new English song Battle Field and its promotional music video for The Great Wall on November 22, 2016. The song was composed by King Logan and Maroon 5's keyboardist PJ Morton and written by Josiah "JoJo" Martin and Jane Zhang. It was produced by Timbaland. On Rotten Tomatoes, the film has an approval rating of 40% based on 5 reviews, with an average rating of 5.7/10. Due to some of the characters, including a main character played by Matt Damon, being white in a movie set in medieval China, the film has been accused of whitewashing and using the white savior narrative. As the film's largest investor, the Wanda Group (owner of Legendary Pictures) has good relationships with the Chinese government and the Communist Party of China. In December 2016, users of film review website Douban rated The Great Wall 5.4 out of 10, which is considered very low. On Maoyan, another movie review aggregator, the 'professional score' is only 4.9 out of 10. On December 28, the Communist Party's official media outlet People's Daily published an article on its website severely criticizing Douban and Maoyan for doing harm to the Chinese movie industry with their bad reviews.On the same day, Maoyan took down its 'professional score' for The Great Wall. It looks interesting, thanks for the news.